No special training is needed to install and start using Speed Plus. It can be easily located anywhere you desire; it doesn't take up much space. 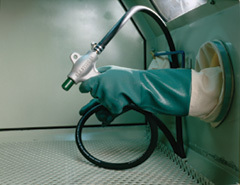 Its unique design works with a low flow of air allowing the use of 7.5 HP compressors. Speed Plus, is designed to perform prolonged blasting operations as it possesses a high filtering capacity and great blasting power. Pneumatic Foot Pedal. 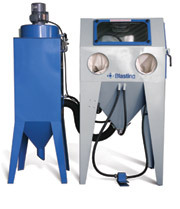 Comfortable, efficient and strong, the pneumatic foot pedal initiates the blasting process.